Jerusalem Artichokes: Time to dig ’em up! It’s that time of year again for us Kitchen Gardeners – time to dig up those prized Jerusalem Artichokes and concoct or create some tasty and nourishing recipes to share with family and friends. I planted my weird looking, knobbly artichokes early last spring – then the plants grew to about 12 foot tall, and were topped with what looked like big yellow daisy flowers. Jerusalem Artichokes are supposed to be ready to eat from December to March, but the ones I dug up in early December were a bit small so I left them until just after Christmas and found buried treasure! I followed all the instructions for cultivating these strange-looking plants, and not being exactly sure what I would find under the ground, I was thrilled to find that when I dug my spade into the soil, very gently, for each plant I found a bucketful of the weird and wonderful roots, and most are of a decent size, about 3 – 4 inches long. Here are some of them, with our own leeks. So, what recipes am I going to turn these Jerusalem Artichokes into? Luckily I have found some that sound just great, and I’m going to have a go with all sorts of different flavours. Here goes! This is a lovely and earthy winter salad. It can be slightly warm, putting the goats cheese on whilst the artichokes and pears are still warm from the oven. Heat the oven to 200C/ 190C fan/ Gas 6. 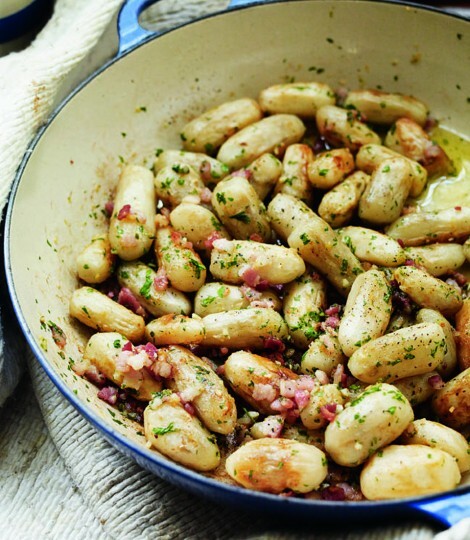 Heat a little of the olive oil in a small frying pan and toast the brazil nuts until golden, tossing every now and then. Set aside to cool. Put the jerusalem artichokes in a large roasting tin and toss with the quartered pears (reserving 5 pear quarters), sage leaves, balsam vinegar, 4 tbsp olive oil and sea salt. Roast for 45 minutes, shaking the pan halfway through, until the jerusalem artichokes are lightly golden and chewy. Remove from the oven, squeeze over the lemon juice and leave to cool slightly. Transfer the roasted artichokes and pears to a large serving dish using a slotted spoon, then gently toss through the nuts and lemon zest. Finely slice the remaining fresh pears and toss with the rest of the salad. Top with dollops of the goat's cheese, drizzling over any remaining roasting juices. You can peel the jerusalem artichokes, although the skins have a pleasing chewy texture when roasted. If you’re peeling them, try to buy larger artichokes, which are easier to prepare. Toast the brazil nuts, and roast the jerusalem artichokes and pears the day before. Keep them covered and chilled, then either warm in a pan or bring to room temperature and continue from step 3, adding the lemon juice when you add the zest. Really looking forward to this recipe above. The delicate flavour of the pears, the earthy, nutty artichokes and the soft, pungent goat’s cheese will all add up to an exciting winter dish. I think it will definitely be a favourite of ours. 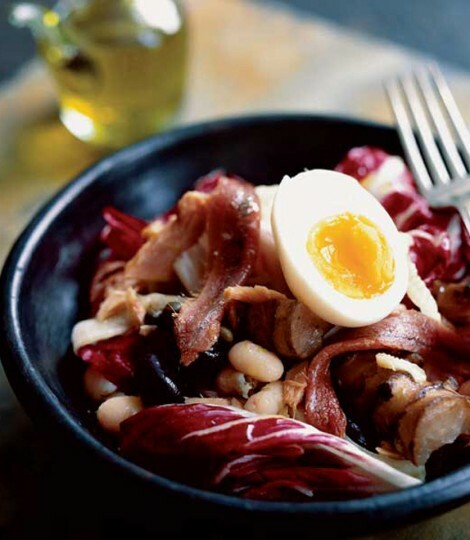 This next recipe I am going to have a go at using our own Jerusalem Artichokes is entitled a “Wintry Nicoise Salad”, and just looks the sort of recipe that would be perfect as a smart starter for a meal with friends, or as a light supper. Full of great seasonal vegetables, and looks quite mouthwatering. This recipe for Wintry Nicoise Salad is overflowing with winter vegetables, but has the wonderful flavours of a summer Salade Nicoise from France. The stunning colours make it such an appetising winter salad, to share with family or lots of friends. Toss the artichokes in 1 tablespoon oil and roast for about 30 minutes, or until they are tender and slightly caramelised. Set aside. Meanwhile, while the artichokes are roasting, discard the tough outer leaves of the fennel and slice the heart finely. In a large bowl, combine the remaining oil with the orange juice and lots of black pepper to make a dressing. Add the fennel, toss in the dressing and set aside to marinate. Soft-boil the eggs. For creamy rather than truly runny yolks, add the eggs to boiling salted water and cook for 7 minutes. Plunge into cold water to cool immediately. Peel as soon as you can handle and halve. Add the warm artichokes, beans, radicchio leaves, olives (stoned), capers and tuna chunks to the fennel and toss everything in the dressing. Season to taste. Serve in individual bowls and garnish each with an egg and anchovies. “Jerusalem Artichokes with Bacon, Garlic and Lemon” is the title of the next recipe. What a fun sounding dish to eat in winter. I imagine a big steaming bowl of all these ingredients with some crusty bread (hopefully Sour Dough) to mop up the juices. What I love about these particular artichokes is that they are so versatile. Salads, soups, roasted, gratinated …… the choice is endless. See what you think. 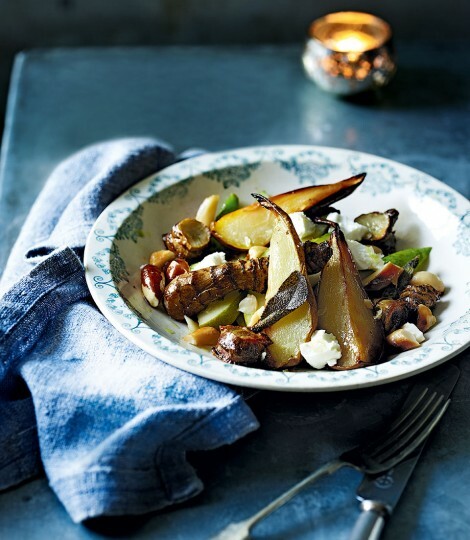 This recipe for Jerusalem Artichokes with Bacon, Garlic & Lemon is a great way to use up your home-grown Jerusalem artichokes at this time of year. You could just have a big bowl of this with some crusty bread to dip in the juices, with a locally-brewed glass of beer. But it would go brilliantly with Fried Chicken or juicy Lamb Chops, but I am going to serve it this weekend with a comforting casserole, probably a Carbonnade de Boeuf, or some sort of beef casserole with the addition of a light beer added to the mixture. Maybe just add some simple, stir-fried Kale or Savoy Cabbage with a hint of chilli to give it a 'kick'. Finely grate the zest from the lemon onto a plate, cover with cling film and set aside. Halve the lemon, squeeze out the juice and put the juice and lemon halves into a bowl with plenty of cold water. Peel the artichokes, cut away the ends then cut into two if very long. Trim a little from each end to give barrel-shaped pieces, then drop the into the lemony water as you go, to stop them discolouring. Heat 2 tbsp of the oil and half the butter in a large sauté pan or deep frying pan over a medium heat. Whilst the artichokes are cooking, cut the bacon into lardons. Five mins before the artichokes are cooked, heat the remaining oil in another large pan or shallow flameproof casserole. Add the bacon and fry gently until just turning golden and slightly crispy. Add the garlic and leave to cook for a few seconds, then stir in the remaining butter, reserved lemon zest and the chopped parsley. Carefully tip the cooked artichokes into the second pan and gently toss everything together. Season to taste with salt and pepper then serve. This weekend we have one of my oldest friends coming to stay. Dil from Wales, who I’ve known since about 1967. I’ll definitely be cooking the Beef Casserole plus the last recipe, and I’m really looking forward to it. I have quite a few more recipes using our own Jerusalem Artichokes – the soup recipes sound superb – so look out for those coming up soon. As my Kitchen Garden will expand this year, I love finding lots of the more unusual recipes to use up all my fruits and vegetables when we have a glut of produce. Maybe one day I will write a book overflowing with all these recipes, but for now sharingourfoodadventures.com will suffice. Hope you have a go at growing these weird but wonderful vegetables – apart from planting them and making sure they have sufficient water, you just leave them for months and then suddenly they are ready, and will amaze you with their delicate but earthy and nutty flavour. Just have a go – the taste will surprise (and delight) you. 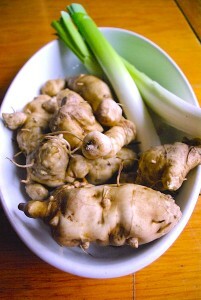 More Jerusalem Artichokes: Recipes & Tips.